This month's Petite Fashion Challenge is hosted by Khatu of I am Khatu. She asked us to "Restyle a glamorous look that you would typically wear for a night-out-on-the-town into daytime casual wear"
I picked out a sequin skirt for this challenge. Sequins are everywhere these days, have you noticed? Generally , sequin pieces are reserved for night parties and events. However, if styled correctly, sequin pieces are acceptable for both night and day. For this challenge, I paired a sequin skirt with a comfy sweater and a button down shirt. I’ve been working on this skirt for about a week and am happy with the way it turned out. I will have to show you more in a later post. A pair of riding boots finish off a casual daytime sequin look. A big thank to Khatu for hosting this month. Don't forget to head over here to check out the rest of the entries! Lovely. This is such a cool challenge. Hmm...if only I wasn't style-challenged. Great job on the skirt. It look great paired with the shirt and sweater. That skirt is a DIY?! Awesome!! I am so excited to see your post on it! DIY sequin skirt?? Seriously? Girl, you're my hero! Love the sequins and checks together. Bravo. I think you are great, but man does you blogger name bother me...Ever consider changing it to petite little lady or something? petite little girl just sounds so...well you know.. I love how preppy this looks, even with the sequin skirt! I can't believe that's DIY! DIY?? Do tell us how to do it!!! DIY? I'm so curious! Please tell us how you did it! Love the big sequins and the fact that you made that skirt yourself! So, so impressive! Love everything about your outfit and my jaw dropped when I saw your skirt is a DIY- amazing! Wow! the DIY skirt is amazing! Your outfit looks well-put-together and comfortable at the same time! Like the way you put gingham and sequined skirt together, it's unexpected but looks very nice on you. The Zara message bag also caught my eyes before, but I didn't purchase then. How do you think of the quality of this one? Thanks ahead. I love the sequin skirt. Love how you paired it with a sweater and dress shirt. Love how you made the outfit work for both night and day without changing anything. Amazing job on that DIY skirt! This is such a wearable look...love it! @Helen The quality is great in my opinion. I was happy to pay full price for it which I rarely do. It's on super sale right now. The price is unbeatable especially for a real leather clutch. You made that skirt??? Wow! This whole outfit is awesome, love the styling! Preppy glam, is that a term? If not, well I'll coin it now because that's what comes to mind when I see this outfit :) Love how you've been practicing your sewing skills, Sydney. Like everyone else, I'm looking forward to that future post. Love how you styled the sequins for daywear. And DIY?! Echoing everyone else here - that's amazing. I'd love to know how you did it! OMG, i can't believe you made that skirt!! you'll have to show us! Love this look you have really great taste! Seriously can't believe you made that skirt! 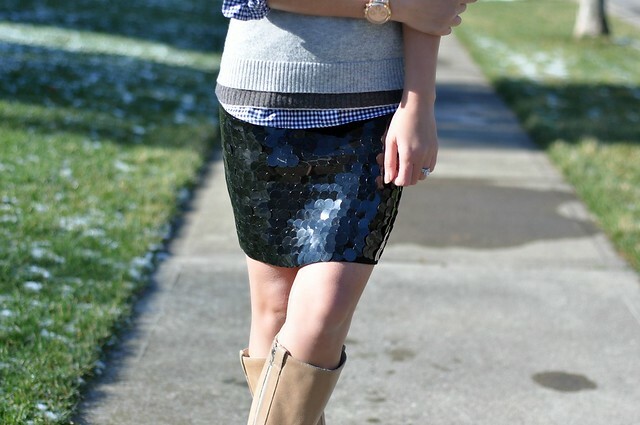 Love how you've styled your sequin skirt! What?!?! You made that skirt Sydney? Holy cow it's GORGEOUS!! What a beautiful outfit! I like the idea and the skirt (GREAT DIY! ), but it just looks messily put together and the patterns clash a lot. No bueno.